Dallas Stars GM Jim Nill continues to lock down his RFAs as the Dallas Stars announced today that the club has signed forward Matt Fraser and defenseman Cameron Gaunce to one year, two-way deals for 2013-14. Both players finished the season in the AHL with Texas and are expected to be competitive in training camp for a role on the NHL roster. Matt Fraser has played almost every game of his professional career in the Stars organization. The rising third year winger leads the Texas Stars franchise in goals (70) and has led the club in individual season goal scoring each year he has been with the team. He was also an AHL Second-Team All-Star last season. He spent the last month of the season with the Dallas Stars, notching 12 games but having trouble finding his usual scoring success. In 13 NHL games, he has only scored a goal and an assist. Fraser, or a linemate, has to find room for the winger to take his shots. He has a wonderful shot when he has the space to make it. Too often that wasn't the case in the NHL. To be successful, he has to get that space this season in the NHL. Cameron Gaunce was acquired at the trade deadline in what seemed to be a 'meh' trade to many outside observers. Tomas Vincour, a forward in and out of favor and luck in Dallas, was traded for a defenseman who had mostly played in the AHL to that point. With Jagr and Roy taking headlines, it got lost in the fray. In the ensuing months, Gaunce performed admirably for the Texas Stars, playing in every game since the trade. Vincour, it should be noted, also did well for Lake Erie with 11 points in six games. However, Vincour is on his way to Europe and the Stars have just locked down Gaunce for 2013-14. 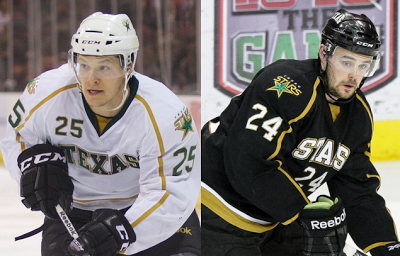 The Texas Stars announced today that the Dallas Stars, the club's National Hockey League affiliate, have signed both left wing Matt Fraser and defenseman Cameron Gaunce to one year, two-way contracts for the 2013-14 season. Fraser, 23, skated in 12 NHL games during the 2012-13 campaign, earning his first career NHL goal against the Nashville Predators on Feb. 25 and recorded three points (1G-2A). Fraser appeared in 62 games this season with Texas, notching 46 points (33G-13A), leading the team in goals, finishing second on the club points and tied for fourth in plus-minus (+13). He appeared in nine games during the 2013 Calder Cup Playoffs and notched two goals. The 6-foot-1 native of Red Deer, Alta., finished this past season ranking first in the AHL in power-play goals (17), second in goals (33) and was named to the 2012-13 AHL Second All-Star Team. Earlier this season, he was selected to represent the Western Conference at the 2013 AHL All-Star Game. Fraser went undrafted and was signed as a free agent on Nov. 17, 2010. He is Texas' all-time leader in goals (70) and power play goals (28) and ranks fifth in career points (101). Gaunce, 23, split the 2012-13 season between the Lake Erie Monsters and Texas, skating in a total of 70 games and recording 16 points (2G-14A) with 98 penalty minutes. The 6-foot-1 defenseman from Markham, Ont., was acquired from the Colorado Avalanche in exchange for forward Tomas Vincour on April 2, 2013. Gaunce made his first career Calder Cup Playoff appearance this year's with the Stars, appearing in all nine of Texas' post-season games. He has appeared in 11 career NHL games, all during the 2010-11 season with Colorado, recording one goal with 16 penalty minutes. Gaunce was Colorado's second-round selection (50th overall) in the 2008 NHL Draft. I've expected all year that Vincour would be heading back to Europe. He seemed really unhappy all season and his play never really picked up to where it should have been. I hope he has more fun with his new team in the KHL. Oh, and Lukowich appears to be officially retired, now, as he's just taken a coaching position with the Lethbridge Hurricanes of the WHL/CHL (IIRC).